1. 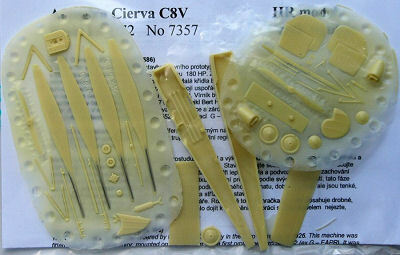 HR Model have released another in their line of resin and etched brass Cierva autogiro variants. This time it is the C.8V (Avro 552A fuselage with Viper engine), with decals for G-EBTX, and it comes with two tail/rudder options. 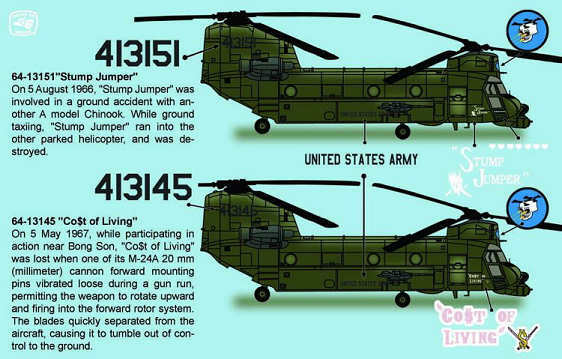 33007 is their 1:72 CH-53 with HMX-1 "Nighthawks" VIP markings. 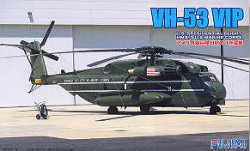 Note that although the boxart appears to show a VH-53E, the kit is actually a CH-53D / VH-53D. 72198 is their 1:72 AH-1S with markings for JG-3477 in a scheme commemorating the 15th anniversary of the JGSDF Metabaru Base. 31108 is the same special scheme AH-1S but in 1:48 scale. 3. Cobra Company have released a XM-23 door-mounted M60 machine-gun set, suitable for any 1:48 UH-1 kit, #48050. This gives you two complete guns with ammo belts, and their mounts. 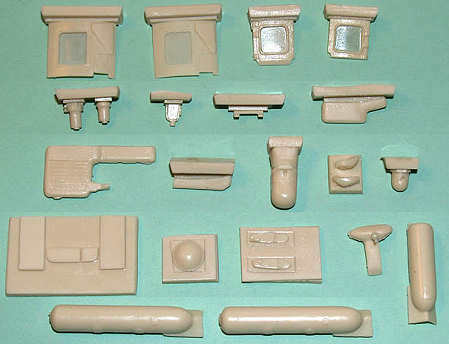 And most recently released by Cobra Company is #48051, a multi-piece resin detail set for the Academy/MRC CH-53E. 4. The 1:72 HH-60J Jayhawk Set is now available from Fireball Modelworks. FM72-001 contains a full decal set and 23 resin parts to build one HH-60J from either the Hasegawa SH-60B or the Italeri HH-60H. 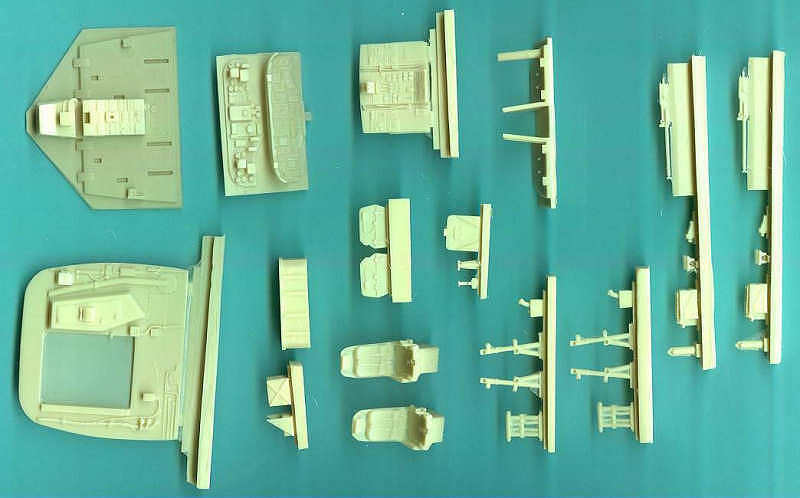 Many of the parts are also suitable for detailing the HH-60H. The decal set includes numbers to build any of the 42 Jayhawks that were produced. Full-colour instructions and a marking guide are also included. A PDF version is available here. You can also get the decals by themselves, scaled up to 1:48 and re-arranged, with additional blue "no hand hold" stencils for the pitot tubes - FM48-D08. 7. 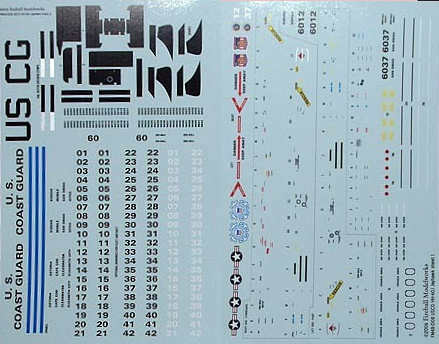 1:48 HH-60J Jayhawk decals from Fireball Modelworks, see item 4. above. 8. 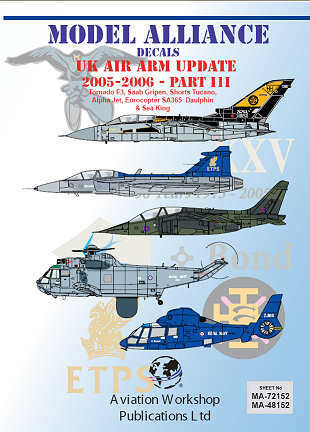 Ready for the UK IPMS Nationals will be parts II and III of the "UK Air Arm Update" decal sets from The Aviation Workshop. Part II will have a UK 33 Squadron Puma including the Special Forces large sponson aircraft, 33 years of Puma special markings, and the Operation Telic markings. This will also have the DHFS Squirrel previously released in the Old Model Alliance / Hawkeye Models range. 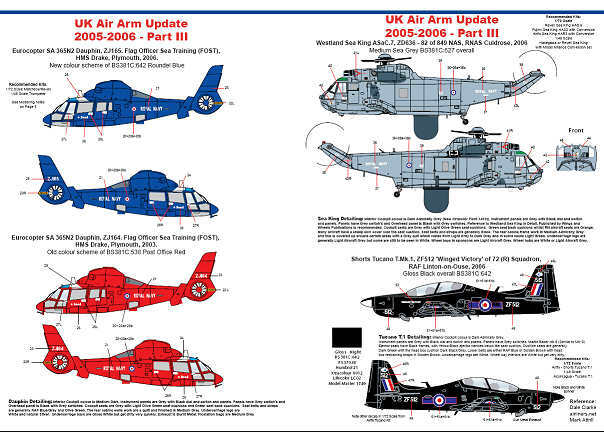 Part III has the UK Royal Navy Sea King ASaC7 and SA365N2 Dauphin in both red and blue colour schemes. Following on will be "World Wide Air Forces Update" Part I, with the Australian Army Tiger and the USMC HH-60 Black Hawk, and Part II including the RAN SH-2G Seasprite plus Danish and Portuguese Merlins. Due in Jan-07 is sheet of US Coast Guard aircraft including Jayhawk, Pelican, Dauphin and Shark, all sheets mentioned here will be available in both 1:72 and 1:48. 9. Zotz Decals have announced 1:72 and 1:48 sheets for the ACH-47A, #ZTZ48-025 and ZTZ72-025. These will have artwork for 'Easy Money', 'Birth Control', 'Stump Jumper', and 'Co$t of Living'. 10. 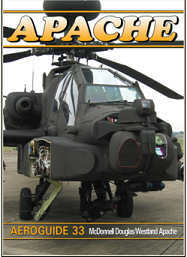 Aeroguide No.33 from Ad Hoc Publications covers the Apache. The author is Roger Chesneau, you get 56 A4 pages and c.150 photographs, line drawings and colour profiles, ISBN 094695848. Thanks to Joseph Osborn (Fireball) and Gary Madgwick (The Aviation Workshop. ).